What do you, the most unabashedly selfish and inconsiderate member of your friend group, buy this holiday season for that one person in your life whose giving is not restricted by our Gregorian calendar? 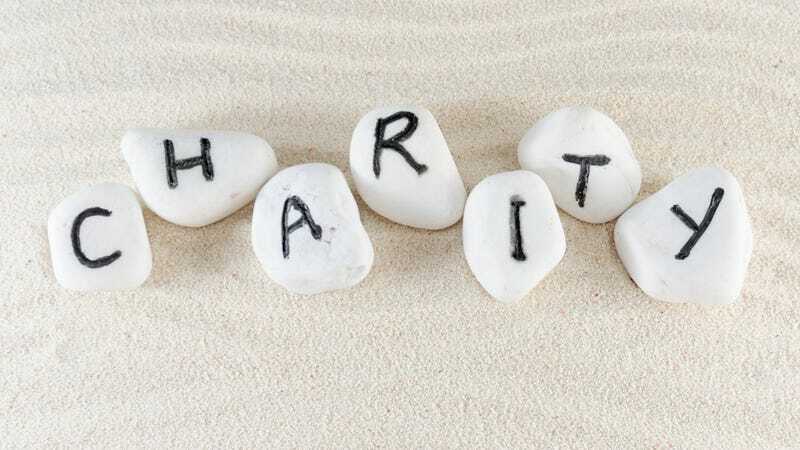 To defeat the charitable people in the world, we must first understand the charitable people in the world, and the following list of possible gifts is a pretty good place to start. DonorsChoose.org is an all-around adorable and efficient charity that lets donors fund the most promising/ambitious/endearing classroom projects in the country. Public school teachers post class projects on the site, thereby letting potential donors give any amount to any project that strikes their fancy. It's such a terribly awesome chairty that MsMichelleR has decided to get her husband a DonorsChoose gift card for his birthday, but don't anybody ruin the surprise like I just did. For any amount over $50, the charitable object of your holiday-inspired munificence will receive hand-written thank-you notes from the students to whom he or she donates. Holiday Gift Guide: What Do You Get Someone Who Is Truly, Deeply Charitable? Heifer International aims to help kids and families all over the world become self reliant through the resource that keeps on giving sellable goods: livestock. In the name of your charitable gift recipient, you can help a family start its own apiary for $30, or (for quite a bit more) you can target your gift specifically towards Women's Empowerment, which, through training and financial assistance, helps mothers get work and become self sufficient. There's something for pretty much every charitable soul at Heifer International, and the organization's sundry gift options should help some distant family gain a firmer foothold in the world, which is probably why juniperjones suggested this in the first place. We're all a little weary of politics after emerging from the long, election-cycle sewer tunnel, but if you have a politically avid friend who just watched the candidate he or she supported lose an election, you can donate in that friend's name to help the now-defunct candidate tackle a mountain of campaign debt. All community supported agriculture organizations and farmers markets operate a little differently, but Local Harvet can help you sift through the particulars and find the subscription/membership that's best for your agriculturally conscious gift recipient. This could be a seriously awesome gift depending on your local CSA scene, but this is an especially great gift for those people who are particularly involved in community activities and extremely conscious about the source of their foodstuffs. Hurricane Sandy charities are clearly the hottest charities this holiday season, which means that there are probably a ton of scammers trying to score some Sandy cash money through flimsy organizations that don't help any storm victims. Capitalism is a vicious beast, dude, but fear not because CharityNavigator.org is a pretty good way to find a legit Sandy charity, like the Foodbank of Monmouth and Ocean Counties, an organization you can donate to in your gift recipient's name. How well do you really know this big-hearted companion of yours? Can you ever really know anyone? The answer, of course, is no — people are enigmatic puzzle boxes wrapped in shrouds of deception and mystery, so rather than just pick a specific charity and donate in someone else's name, get that special charitable someone a Charity Gift Card from CharityNavigator.org. I know, I know — gift cards are horribly dehumanizing and impersonal, but giving someone an endangered orangutan straight off the boat from Borneo is probably an awful and definitely an illegal idea, so a symbolic gift adoption card from the World Wildlife Fund is probably your best bet. Plus, the WWF will send the card recipient a color photo of their adoption animal hitting the roulette table in Monaco with the donation money. Secretly list your friend or family member's place on Couchsurfing.org. It's a can't-miss gift. What gift could be more appropriate for a truly charitable soul than a box of forsaken baby animals that will need round the clock care and love in order to survive? Also, stray kittens (ubiquitous in urban areas) are free so long as you don't let any of them draw blood* when you're boxing them. I'd say about a baker's dozen should keep that do-gooder of yours thoroughly occupied through the new year, though some people are more resourceful than others and a few extra kittens never hurt anybody (anybody who lived to tell the tale of local feline toughs, that is). If the object of your calendar-appointed generosity is allergic to cat dander and you live in a place like, say, Florida, you might want to go with a box of assorted stray monitor lizards, which you can collect so long as you exercise a little more caution. This holiday season, remember that monitor lizards need love too, even if their black, soulless eyes seem to speak only of unfathomable Triassic horrors.